GRAND Chief Sir Michael Somare remains in office regardless of the wishes of his family, the president of his National Alliance party said yesterday, The National reports. “The position now is that the Somare family has made its wishes known,” National Alliance president Simon Kaiwi said yesterday. “They do not want their father to continue as a politician. That is understandable. “In terms of the positions that he (Sir Michael) holds as prime minister, parliamentary leader of NA and East Sepik member, he stills holds those positions. He said Sir Michael’s position as prime minister would only be determined by parliament after legal requirements were satisfied. The process to replace Sir Michael as parliamentary leader of NA begun in February this year at the Grand Chief’s own behest and was now well advanced, Kaiwi said. Kaiwi said the next caucus meeting, scheduled to be held in Jiwaka, would determine the party leadership position. That process started in February when, in consultation with the Grand Chief, Kaiwi was told to prepare for a successor to Sir Michael. The parliamentary wing of NA, comprising 42 MPs, would convene in Minj town to elect the leader of the National Alliance. That leader would be NA’s choice for the PM’s post should a vacancy occur by then. Should a vacancy occur before the July meet, Kaiwi said it was the sole prerogative of parliament to elect a prime minister. The view that the Somare family’s announcement to retire Sir Michael without his knowledge does not constitute a legally-binding decision was also shared by a number of people yesterday. Private lawyer Tiffany Nonggorr said: “It is not a family monarchy we have here in PNG; that Arthur Somare or any member of the family can decide on when the prime minister of this country can step down or not step down. She said that by the application of this country’s section 142 of the Constitution and section 6 of the Prime Minister (PM) and National Executive Council (NEC) Act 2006, “the only way Sir Michael ceased being a PM is when he himself says (from his own mouth) that he has resigned and does so in writing to the national executive council, declaring that he is resigning and, therefore, stepping down”. Or, that he is dismissed, suspended or voted out by parliament. She said the application of such laws safeguard a PM (any PM) and the people of PNG from any actions, unscrupulous or otherwise. She said the proper legal procedures required – under current circumstances – was that, upon advice from the national executive council, the governor-general was required to advise the PNG Medical Board, “who designates two medical practitioners to examine the prime minister”. It would be based on that joint medical report presented to the governor-general “who advises the speaker to advise parliament which would then decide whether to suspend the prime minister on medical grounds or not”. She said only then can a new prime minister be elected by parliament. Outside of that, no one, not even the prime minister’s family members, have any say in whether or not he, as the chief executive of the country, should step down or not. Senior lawyer Peter Donigi had raised similar points and the opposition yesterday called for the appointment of medical practitioners to follow the dictates of the Constitution. ACTING Prime Minister and Wabag MP Sam Abal has assured the nation that the National Alliance-led government is intact and will continue to dispatch its responsibilities until next year’s general election, The National reports. Abal said this during a state-owned enterprises (SOE) consultation on the National Plan and Vision 2050, with the theme “Delivering through SOE” at the Crowne Plaza in Port Moresby yesterday. He said despite speculations that the NA and coalition partners were splitting and regrouping to elect a new prime mi­nister after Sir Michael Somare stepped down, the go­vernment was intact. But the talk in the corridors of power is that seve­ral MPs from the go­vernment are in talks with the opposition to change the prime minister when parliament resumes in August. A few leaders who were interviewed said the coalition partners and NA members remained intact out of respect for Sir Michael. The sources said since the PM had had been advised by his family to retire, the leaders could make their move. Abal said in order to bring stability to the go­vernment and in fostering development, all political leaders needed to focus on the development agenda of the country first so “our people do not have to keep asking why they are still poor in a rich country”. Abal said: “With less than a year to go before writs are issued for the next national election, it is my hope that politicians on both sides of parliament focus their best efforts on the people in their electorates, in deli­vering the best development outcomes possible. Meanwhile, Abal urged all state-owned enterpri­ses to commit themselves to outlining three priority initiatives that could improve their profit margins and result in greater corporate growth. CHIEF Secretary Margaret Elias has urged chief executive officers of state-owned enterprises (SOEs) to be responsive towards the joint efforts to implement policies and directives of government geared towards achieving development objectives, The National reports. She said the CEOs had responsibilities to improve service delivery by providing the environments to support economic growth and social development. She said they should work closely with the Department of Public Enterprises and Independent Public Business Corporation (IPBC) to develop an infrastructure development policy framework which they should present to government as soon as practicable. Elias added that the state-owned enterprises needed to develop a master plan to be submitted to government by the end of this year. “The challenge for you is to offer your services and technical advice to both the rural and urban communities in establishing enabling environment,” she said. “For example, our district treasuries and district hospitals must have electricity and proper water supplies to ensure that they are functioning and which will encourage the local people to access services at the districts. “I challenge you all to support government in improving service delivery under your organisations’ mandates. “It is intended that this forum provides an avenue for effective monitoring, evaluation and reporting to government on how SOEs are supporting government in achieving its policy objectives through the existing mechanisms. She said it was a system under which government would enforce compliance and monitor performance particularly at heads of government agency level. She said there had to be transparency, accountability and commitment in the operations of the organisations they led and be accountable to the government and the people. Elias said the state-owned enterprises must submit their annual profit and loss statements and valuation of assets for scrutiny by government, through the IPBC. BANK South Pacific Ltd will buy back up to K40 million worth of its own shares, chairman Kostas Constantinou announced yesterday, The National reports. The shares buy-back was agreed upon during the bank's capital management strategy discussion during its annual general meeting last month. The buy back is set to open today for a period of 12 months. The board of directors decided to buy back shares since BSP's current market share prices did not reflect the fundamental value of the company. Constantinou said BSP intended to enter the market from time to time to purchase shares pursuant to the buy back, which under this, shareholders are invited to sell up to 10,000 BSP shares of each registered holding. BSP would pay for any brokerage on shares bought back. Selling shareholders would not pay brokerage. At the release of the full-year profit results to Dec 31, 2010, Constantinou informed the market last March that "BSP had achieved sound results last year, characterised by continued profitability and balance sheet growth, demonstrating operational and financial stability". The directors of BSP believed that a measure on market buy back of the company's own shares would complement the share consolidation that was effected early this month. The shares consolidation allowed for shareholders to now receive one share for every 10 shares they previously owned, meaning BSP's share price will, in effect, be multiplied by 10 to maintain the value per share. Shareholders would notice that the current selling price for BSP shares stood at K6.68 from K0.68, and where they had 1,000 shares, they now have 100 BSP shares. ANGORAM MP and Minister of Public Enterprises Arthur Somare will face the Leadership Tribunal next Monday, The National reports. The tribunal is to decide whether Somare is to continue as an MP pending the tribunal hearing on allegations of misapplication against him. Much will depend on his submissions before the three-member tribunal headed by Justice Salatiel Lenalia. The other two members are Principal Magistrate Orim Karapo and Senior Magistrate Noreen Kanasa. They were appointed in 2006 by the late Chief Justice Sir Mari Kapi. Lenalia was appointed by Chief Justice Sir Salamo Injia three weeks ago following the National Court's dismissal on June 3 of Somare's last ditch attempts to have his referral stopped. He had argued before a Supreme Court panel of judges headed by the Deputy Chief Justice Gibbs Salika that the proceedings should be dismissed. Salika, however, ruled that Somare's application had "no merit". He added: "The decision to refer, in my respectful opinion, is not unreasonable and capricious in the circumstances and as such, the Ombudsman Commission did not act in excess of its jurisdiction to refer. "In the end result, all the grounds for judicial review are dismissed as having no merit." Following this decision, Sir Salamo said the decision of June 3 effectively paved the way for the new chairman to be appointed and for the stalled tribunal to get under way. YESTERDAY dawned an ordinary sunny Port Moresby kind of day – a little on the windy side – but before it ended, Tuesday, June 28, 2011, was propelled into the annals of PNG history. Shortly after 3pm, an announcement was made that Prime Minister Grand Chief Sir Michael Thomas Somare was retired after nearly 50 years in PNG politics. "Was retired", not "had retired"! The man who has achieved so many firsts in his life has also achieved another milestone at this parting juncture – he could neither himself be present at the announcement of his retirement nor had he participated in the decision himself. His immediate family made the decision for him three weeks ago while he still lay in the intensive care unit of Singapore's Raffles Hospital. The announcement had been delayed in the hope that he would recover sufficiently for the family to consult him on its decision. When that did not happen, the family decided to make the announcement to stop the speculation, to allow him time to recover fully and to make way for PNG to move ahead with the business of government without "Somare being in the way". "We are removing our father," son and Public Enterprises Minister Arthur Somare said in Tok Pisin yesterday, "so that he is not an obstacle for PNG to move ahead". It is a significant moment in the life of PNG when one of the longest serving leaders in the Commonwealth of Nations is removed from our midst. It is a moving time to see a firebrand politician so incapacitated on medical grounds that he cannot make the final solemn decision to retire. Yet, the family decision is the correct one and it must be commended for it. That the family has stood together in the face of great stress and difficulty to make a decision for both their father and in the interest of the nation truly makes them our first family. While retirement should be self-executing and, therefore, ought to automatically remove from him all necessary powers as MP for East Sepik, as National Alliance parliamentary leader and as prime minister, because he did not make the decision himself might raise some thorny legal questions. What is to follow is not clear-cut at all. The family action now removes the constitutional provision for three doctors to declare him incapable to continue in office on medical grounds. That provision is no longer relevant. The action also provides a vacancy in the office of the prime minister. The announcement by the family begins a process that will end with the election of a new prime minister of PNG. Acting Prime Minister Sam Abal is in charge for now but how long he is to continue legally is unknown. While his reign on government, shaky at first, is strengthening and he appears focused and charismatic, this announcement will mean he must first gain legitimacy to continue in office from his own National Alliance party. Since this situation has never before occurred, the laws have not been tested. This situation is unprecedented so that should provide government lawyers with some interesting legal gymnastics. Parliament has adjourned to August, placing it well within the 12-month period when no motion of no-confidence can be moved in the prime minister, yet, there is no prime minister to move a motion against. Only parliament can elect a prime minister so it is important that parliament meets as a matter of urgency and it falls to cabinet to make that decision. Political lobbying, as expected, has begun in earnest and will continue. The ruling National Alliance party, with 42 members, has a head-start but it might not have the advantage that the integrity law guarantees when it states that the leader of the party with the largest number will be invited by the governor-general to form government. That provision, we would vouch, only applies at the end of a general election. In such confusing circumstances, perhaps, a look for direction to the founding father, who now lies ill on a hospital bed in a distant land, might prove helpful. A dangerous constitutional crisis is looming which needs averting but how to do it is the question. What would the Grand Chief do in such a circumstance? That unique ability of his to calmly smother all dissent, to gather differing views and extremities through consultation and consensus, to make sense out of chaos and to move all that mass in one direction, is needed again now more than ever before. The question is: Do we have that man? PRIME Minister Grand Chief Sir Michael Somare has retired from office for medical reasons, his son Arthur Somare announced yesterday, The National reports. The decision was not Sir Michael's, but that of his immediately family members who reached it three weeks ago in Singapore. "He is not in a position to coherently make a decision himself ... that is why we have made the decision,'' Arthur said. "On behalf of Lady Veronica and the rest of Sir Michael's family, I would like to inform the public that it is our wish that Sir Michael will now pursue a life in retirement after nearly 50 years of active politics due to medical reasons and the uncertainty of the recovery period." *As Prime Minister of Papua New Guinea. Somare, who is minister for public enterprises, put on a brave face although he was visibly emotional when making the announcement. "The public was informed at different intervals that Sir Michael has taken medical leave to address a condition that has prevailed over many years," he said. "The initial operation to replace the leaking heart valve was successful but, subsequently, other complications had developed. "These complications have further delayed the anticipated time in which Sir Michael was expected to recover and return to Papua New Guinea." The son said the difficult and trying part of identifying infectious diseases had been cleared but, at the age of 75, going to 76, and after three heart operations, "it will weaken a person of his age". "The uncertainty of when he will be out of intensive care has pushed us into this decision," he said. He said Sir Michael was in ICU and "is not in a position to talk and understand the decision made by the family three weeks ago". 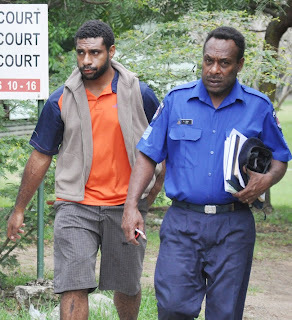 "I have not talked to my father in weeks," Somare said. He said the road to recovery would be slow and "it will be a tedious wait and the family cannot keep PNG waiting". "All five siblings and our mother have taken this decision that he steps down from politics and that Sir Michael is allowed to recover at his own pace. In our considered decision to do this, we believe PNG should have a level of certainty with regard to political stability and leadership well into the future. "He is not only the head of the Somare family. He is the head of the country and there are different processes to be taken to elect a new prime minister. "I am not here for politics but as a family member to announce the family's desire to retire our father. "Taim femili ino toktok, banis istap yet. Nau mi toktok, mi kliarim rot. Em samting bilong palamen, kebinet na pati long mekim disisen. Em bai ino mo sanap long rot. (When the family did not speak out, it becomes an obstacle, but now that I make that announcement, it clears the road for parliament, cabinet and party to make a decision). "This has not been an easy decision to make without full and proper consultation with Sir Michael. "However, in the greater public interest and collective good of the country, we are of the view that this decision is necessary and we believe it will be his desire to do so at this time given the circumstances. "I would like to thank the people of Papua New Guinea for their well wishes, messages of support and constant prayers." 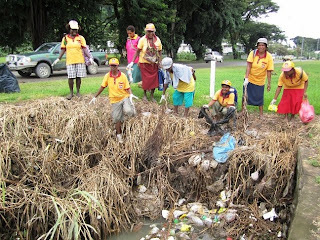 Women of the Seventh-Day Adventist church in Lae, Morobe, walked through the streets of the city collecting rubbish on Sunday, The National reports. About 200 women were divided into three groups and collected rubbish at the three major shopping centres of Main Market, Eriku and Chinatown. Some of the women (above), who had cleaned Chinatown were on their way to the Main Market when they were pictured at the Lae Yacht Club, at Voco Point. The other group, which started from the market, also cleaned the road to Eriku from where other women picked up rubbish on the way to Chinatown. AUSTRALIAN investment broker Evans and Partners has given a “positive” rating to Papua New Guinea mining explorer and developer Highlands Pacific, The National reports. The company is a junior partner in the US$1.4 billion Ramu nickel and cobalt being developed by Chinese giant Ramu NiCo, 18.18% joint venture partner in Xstrata’s Frieda River copper mine in East Sepik and explorer in the Star Mountains of Western’s North Fly electorate. “Highlands Pacific remains our number one recommendation within the copper space, due largely to the extreme discount to valuation the company is currently trading,” research analyst Cathy Moises said in Evans and Partners’ Australian resource sector report released last week. She wrote that with a decision on the Ramu NiCo submarine tailing disposal court case expected later next month, a trebling of the exploration focus in the Star Mountains and final definitive feasibility study for Frieda River due in January 2012, the news flow would be significant. Frieda is the key asset, she said, noting that it was one of the world’s largest undeveloped copper/gold resources. “Subject to the project continuing to meet its project hurdles, a 12-month feasibility study is due for completion in January 2012, with possible construction commencing in 2012 and production in 2017,” Moises said. The pre-feasibility study provided for a 60mtpa operation for the first eight years of mine life and 50mtpa average for LOM (when processing harder ore). RECIPIENTS of the Tertiary Education Study Assistance Scheme (Tesas) loan from 2000 to 2007 are urged to start repaying their loans to the Office of Higher Education through the Department of Finance and Treasury, The National reports. OHE student support and scholarship assistant director Joseph Morimai said recipients living in the National Capital District should go to the cash office at Vulupindi Haus and make payments to finance revenue vote #106.01. Recipients in the provinces could visit their district treasury office and make payments to the same vote. Those employed recipients are asked to provide their employment details to the OHE. Morimai said copies of the receipt should then be faxed to the OHE for their database and cross-check purposes. He said the OHE would design and maintain debt recovery database to allow accurate accounting of individual student’s loans and repayments, and to keep all student data. He said since its inception in 2000, OHE had loaned close to K6 million to more than 3,000 students in Tesas attending nursing, teaching, technical and business colleges and universities. “So far, only two women have repaid their loans since the Tesas loan scheme started,’’ he said. The loans scheme was developed to help students enrolling at universities and non-university institutions pay their tuition fees. The four scholarship categories were academic excellence scholarship (AES), Higher Education Contribution Assistance Scheme (Hecas) and self-sponsored. The service was suspended in 2008 to allow OHE to develop ways to get its money back. POLICE officers implica­ted in the death of a Kokopo Business College student will be suspended pending an investigation, Police Commissioner Tony Wagambie said yesterday, The National reports. He condemned the actions of a group of policemen who allegedly assaulted a final-year management student who died while in police custody. Wagambie said if the reports into the alleged beatings and death were correct, “then the policemen responsible will be dealt with accordingly”. “Nobody is above the law, even if they are police officers,” he said. As he made his hard stance known, Acting Deputy Commissioner operations Fred Yakasa announced one policeman had been committed to stand trial and three others were facing charges in relation to the death of a man in custody in Kimbe, West New Britain, early this year leading to a riot in that town (story on page 3). East New Britain provincial police commander Supt Sylvester Kalaut yesterday maintained, however, that he needed to have “concrete evidence” on the allegation that his officers were involved in the student’s death. He said it was mere speculation by the community and the school administration to force an internal investigation on his officers. Wagambie spoke out after a group of policemen from Kokopo, East New Britain, stormed the Kokopo Business College, fired tear gas, raided a male dormitory and assaulted students. The officers allegedly beat up the final-year student, Stanis Jiki, in his dormitory and hauled him and three others to the police cells where Jiki was said to have died. Wagambie said police were allowed to “use force”, when carrying out their duties, but the “nature of the situation” must justify the type of force used. “I have not been formally briefed,” he said. “But if it is true (killing), then, administrative procedures will apply. He said a similar case where police brutality had resulted in the death of a local youth in nearby Kimbe, West New Britain, had resulted in three police officers committed to stand trial. He said another policeman in Port Moresby was last year sentenced to 22 years in jail for discharging a firearm in public and pointing a gun at members of the public even though he did not kill anyone. Wagambie passed his condolences to the relatives of the deceased and appealed to the students not to take the law into their own hands. His comments came as four male students from the Kokopo Business College appeared before the Kokopo District Court yesterday on charges of arson and damaging school property. The students were all from Wosera in East Sepik. They were Winsaslaus Bagamu, a second-year student, Noel Wapikundi, Edward Jiriwahu and Bradley Wambi, all first-year students. They were charged on Saturday under section 67, subsection 1A of the Criminal Code. Their cases had been transferred to the Kerevat District Court and were remanded in custody at the Kerevat Correctional Services. The four were refused police bail and had been ordered by magistrate Samuel Lavutul to file for bail application. The burning down of the office administration building was in retaliation to the death of Jiki. Kalaut yesterday said the school administration had complained that police officers had beaten up Jiki. He confirmed that a post- mortem would be conducted on Jiki this week, once doctors at the Nonga Base Hospital morgue were ready. It was understood that a protest march was being planned by KBC students and staff for today. A POLICEMAN will stand trial in the National Court over the killing of a man which sparked a riot in Kimbe, West New Britain, early this year, The National reports. Acting Deputy Police Commissioner and chief of operations Fred Yakasa said in a statement yesterday that three others would be committed to stand trial in what is known as the ex-offico indictment. The announcement came as the dead body of a student was found in a police cell on Saturday morning in neighbouring Kokopo in East New Britain. Policemen are said to have fired tear gas and stormed into the dormitory on Friday night where they beat up students and dragged off four to the police cells for questioning. Police Commissioner Tony Wagambie yesterday said any policeman found to have been involved in the death of the student would be dealt with. Yakasa named the policeman to stand trial over the Kimbe murder as First Const Paul Karl. Three other policemen who appeared separately for the same offence, but had their cases struck out due to insufficient evidence, were named as Chief Sgt Godfrey Kambania, Const Alex Tokavai and Gabriel Nomu. All four policemen were charged under section 7 principal offenders of the Criminal Code Act. Yakasa said section 7 of the Criminal Code Act covered people who were merely present when an offence was committed but did nothing to deter or prevent the offence. “In this particular case, they are members of the constabulary who have sworn an oath to protect and serve the public. “By allegedly not doing anything, they are just as guilty of criminal neglect. “However, in this particular case there was overwhelming evidence proving their involvement in committing the crime. “We are, therefore, arranging with the state prosecutor’s office to commit the other three to stand trial through the ex-officio indictment,” Yakasa said. In the meantime, their serious disciplinary offences report had been submitted to internal affairs directorate for speedy adjudication. Yakasa said the police hierarchy was serious in ensuring members of the constabulary were held accountable. “Let me make it very clear again that the Wagambie administration will not tolerate undisciplined, abusive, corrupt and unprofessional policemen. “We will hold all members accountable for their actions or inactions,” Yakasa said. INVESTMENT broker Evans and Partners has described Highlands Pacific and Marengo Mining as among exciting “new kids on the block” in the copper sector of the Australian market, The National reports. Looking beyond the three major pure copper producers in Australia, the broker highlighted opportunities among the junior producers, namely Highlands Pacific, Marengo, Intrepid Mines and Sandfire. However, it said Indonesia was not as pro-mining as neighbouring Papua New Guinea where the Highlands Pacific and Marengo had large scale porphyry copper projects while Intrepid Mines had its projects in Indonesia. Sandfire has a higher grade copper project in DeGrussa, Australia, it noted. “As expected given the long term and capital intensive nature of development, the porphyries are trading at a greater discount to valuation,” Evans and Partners said in a report released last week. It said that while Highlands Pacific remained its preferred copper producer among the junior sector, Intrepid Mine also featured as an interesting producer, “with a large discount to valuation and strong exploration upside, but with a higher risk profile due to location within a protected forestry region in Indonesia”. Highlands Pacific has a 18.8% interest in Frieda copper project in Ambunti-Dreikikir electorate, East Sepik, being developed by Xstrata as well as interest in Ramu nickel and cobalt project being developed by RamuNiCo in Usino-Bundi electorate, Madang, and exploration in the Star Mountains of North Fly, Western. Marengo Mining has a 100% stake in the Yandera copper and molybdenum project in Usino-Bundi electorate, Madang. Evans and Partners said that a positive for the project was that a Chinese off-take partner might take a stake. It is a three-million tonne attributable copper resources and has a production timeline from 2015. The broker also noted that Yandera was a very large scale project, unusual for a junior to retain a majority stake in such a large project. POLICE officers who fired tear gas and stormed into the male dormitory at a boarding educational institution are being questioned over the death of a student, The National reports. The incident happened last Friday at the Kokopo Business College in East New Britain. In retaliation, the students later burnt down the administration office building and, among other things, damaged the principal’s residence. Provincial police commander Sylvester Kalaut said he was aware of the accusation of police brutality levelled against his officers. He said the officers involved were being questioned. The final-year management student, who died on Saturday morning, was identified as Stanis Jiki. Deputy principal of the college John Karis said the police officers went into the school premises last Friday night after receiving a complaint. He said they fired tear gas, went into the male dormitory and questioned Jiki, a student from East Sepik. Karis alleged that they also beat him up. Karis said the officers then took Jiki and three other male students to the Kokopo police station. Jiki died in the early hours of Saturday morning. Karis said he broke the news to the campus and then warned the principal to vacate his house be­cause he suspected that the students were likely to retaliate. Karis said he then fled the campus with his family. The students later went on a rampage, damaging the principal’s house and setting fire to the administration block comprising 11 rooms. They also destroyed the school’s internet server and broke into the computer laboratory, taking out computers and throwing them over the school fence. Two fire trucks arrived at the scene later but could not put out the fire. On Saturday morning, female students were seen leaving with their belongings to stay with relatives and friends outside the college premises. Kalaut said 50 students had been taken in for questioning. He said some would be used as witnesses while others would be charged with arson and causing a riot. THE adjournment of parliament for five weeks is designed to avoid issues affecting the country, Opposition parliamentarians said, The National reports. When parliament re­sumed last Friday, leader of government business Paul Tiensten moved that it be adjourned until Aug 2. He said that parliament should not be allowed to continue be­cause no water was supplied to the house when one of the main pipes from the main water supply at Mt Eriama was broken. He said the air-conditioning units depended on water. With no water, the units would not function properly, making it un­comfortable for those in the chamber. The opposition called for a division, but Speaker Jeffery Nape, who had been absent for the past two weeks, ruled in favour of the go­vern­ment. Led by former deputy Opposition leader and member for Lae Bart Philemon, the MPs ac­cused Nape of taking sides and “hijacking the parliamentary process”. Nape then told Philemon not to point fingers at him and to respect the chair. “You do not point at the chair. “You are discrediting the chair,” Nape said. Philemon yelled back, telling him that he was not being fair and that he (Nape) was to be blamed for hijacking the parliamentary democratic pro­cess by collaborating with the government as he was a member of the ruling National Alliance party. Soon after parliament was adjourned, the opposition called a press conference where they accused the government of planning the adjournment “to avoid issues facing the country”. *Protest march and petition by the public led by NGOs last Thursday. Deputy Opposition leader Sam Basil said: “The speaker is creating divide and rule tactics. Moresby Northwest MP Sir Mereke Morauta said: “This go­vernment is morally corrupt. “There is no reason why parliament should be adjourned. ACTING Prime Minister and member for Wabag Sam Abal has assured the 40,000 contributors of Nasfund that their superannuation savings will be protected, The National reports. He said he would not allow their lifetime savings to be burnt for a second time. Abal assured unions that his priority (as prime minister) “is to protect contributors’ funds from being unscrupulously swindled by persons and institutions entrusted to protect their superannuation savings”. “We are talking about an issue that is significant to ordinary Papua New Guineans, many of whom are contributors to Nasfund, the hardworking people of this country,” he said. “I want to assure the contributors that I will deal with the matter of interest to them based on advice that is consistent with the laws of our land, particularly the Superannuation Act regulating the industry. “To my knowledge, the same contributors who tirelessly work for their living by allowing their savings to grow in superannuation funds such as Nasfund, have been burnt before. “They have lost a considerable amount of their hard-earned savings, which has not been recovered. “My interest right now is to protect the contributors’ funds. “I refuse to stand here and condone sinister activities, especially by those in-the-know and allowing this same group of contributors to be burnt twice over. “There are many issues arising in relation to the transaction. However, in this instance, I must make sure that their exposure is mitigated. “I intend to make sure that contributors will not be in any worse position than they were prior to this transaction,” he said. Abal said the controversy warranted him taking some immediate remedial measures. He said he was aware that the Central Bank, as regulator of the superannuation industry, had made some findings with certain recommendations based on these findings. “Additionally, I am aware of the calls by the unions concerned to have certain persons involved in the unpopular deal removed. “I will be pooling these findings and views of the unions, as well as information available to government together to form the basis of a decision whether to call an inquiry into the matter,” Abal said. Former treasurer Peter O’Neill had earlier revealed that the transaction was illegal and that the report would be presented to parliament by the acting prime minister. THE United Resource Party caucus has sacked party founder and Southern Highlands Governor Anderson Agiru, The National reports. The expelling of Agiru and Komo-Margarima MP Francis Potape stemmed from their alleged involvement in the sacking of URP leader William Duma as petroleum and energy minister. URP leader and Hagen MP Duma and deputy leader and Eastern Highlands Governor Malcolm Kela-Smith announced in a short statement yesterday. Duma said there were many reasons but they were “internal party matters that are best kept away from the public domain”. Duma said there were several reasons for the expulsion of Agiru but the main reasons were his continued and persistent efforts to undermine the URP leadership, the party and its activities and his conduct and behaviour resulting in the his (Duma’s) sacking as minister for petroleum and energy. “Despite numerous attempts to get Agiru and Potape to a meeting, they have been actively involved in my removal as minister,” Duma alleged. “The URP parliamentary wing and party executives thank Agiru for his valuable contribution towards the development of URP as a partner in the NA-led coalition government and wish him well,” Duma added. Kela-Smith said the URP was a disciplined party and Agiru had his own agenda and “continues to undermine the party leadership”. With the sacking of Agiru and Potape, “the party is now solid with nine MPs siding with Duma and Kela-Smith”. Duma said a letter outlining the reasons for the expulsion of Agiru had been given to him and signed by parliamentary wing members, including Dei MP Puri Ruing, South Bougainville MP Steven Kama, Middle Fly MP Roy Biyama and Kagua-Erave MP James Lagea. He said the minutes of the meeting were attached to the letter of notice to Agiru. When contacted last night, Lagea denied there was any caucus meeting last Friday and said he was not a signatory to the decision to expel Agiru. Environment and Conservation Minister Benny Allan, who is the MP for Unggai-Bena, said he was not aware of the decision to sack Agiru from the party. ACTING Prime Minister Sam Abal will be petitioned by the family of the woman whose body was found in his compound to pay them compensation, The National reports. This came after his adopted son, Theo Abal, who police had arrested in connection with the woman’s death, appeared in court yesterday charged with wilful murder. The family said Theresa Ori Taisu, who was allegedly killed on June 13, was the mother of four children who had been struggling to pay for their school fees. A family spokesman Kakaito Kasi said the family had prepared a petition to give to the acting prime minister. “We want him to compensate us for the death of Theresa. Her death has put unnecessary financial strain on us,” he said. Kasi said the family had to dig deep into their pockets to meet obligations at the haus krai since last Friday. *Reimburse the family for money spent on haus krai expenses. Kasi said the family wanted to meet Abal to give him their petition. He said they did not know why she was killed. “We only learned of her killing through the media and went to the morgue last Friday to identify her,” he said. He said at the time of her death, she had been living with a friend at Gerehu and worked as a waitress at the Sunset Lodge at Ela Beach. He said Taisu’s children were in the village with Yeare Ori Taisu, seven, and Atu Ori Taisu, six; doing elementary at the Ila Karaeta Primary School in Kerema town. Kasi said Theresa was a divorcee and the second child in a family of five sisters. 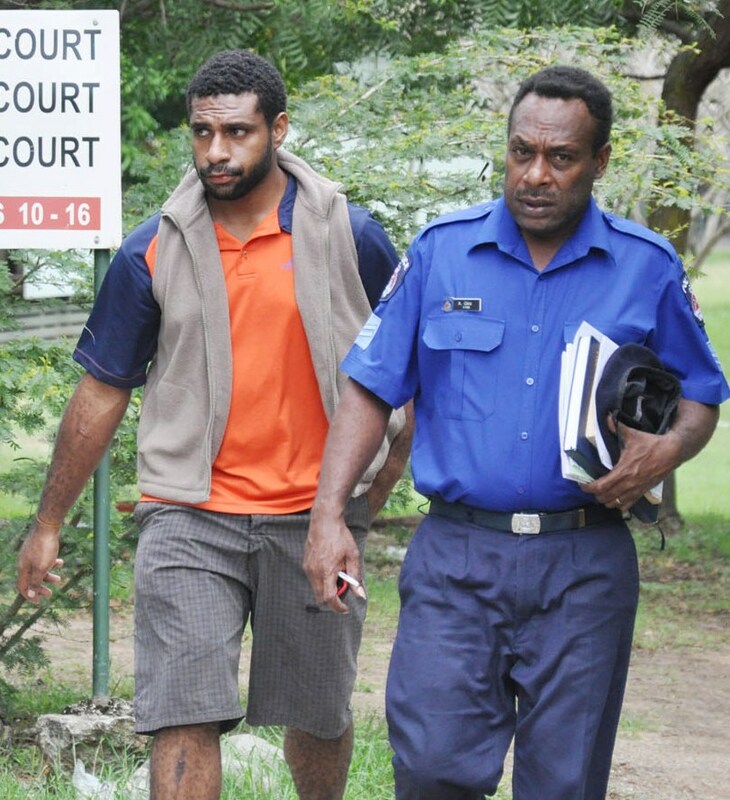 Theo made his first appearance at the Waigani District Court yesterday. Theo, 21, from Pawas village in Enga, was charged by police last Friday. Magistrate Cosmas Bidar told Theo in court that the maximum sentence for the offence was the death penalty. Theo was read the charges against him before being escorted out of the courtroom. The court ordered that Theo be remanded in custody at the Bomana prison and will appear in court again on July 21. A MAJOR cabinet reshuffle, announced by Acting Prime Minister Sam Abal last night, was done with election 2012 firmly in mind, The National reports. It places the ruling National Alliance party in charge of the three most important positions – that of the prime minister, deputy prime minister and finance and treasury with the general election 12 months away. With Prime Minister Sir Michael Somare on extended sick leave and was unlikely to return to the job, Abal had used the reshuffle to place the ruling National Alliance firmly in charge leading into next year’s general election. The reshuffle saw the leader of major coalition partner, the People’s National Congress’ Peter O’Neill dumped from finance and treasury and the re-entry of Momase NA deputy leader Patrick Pruaitch to his old job. O’Neill had been consoled with Abal’s ministry of works and transport. O’Neill is the second coalition leader to be so treated. Two weeks ago, the leader of the second biggest party in government, United Resources Party’s William Duma, was dumped from the petroleum and energy ministry. The ministry was yesterday given to Francis Potape, who was purportedly sacked from URP last week. Foreign affairs, trade and immigration, vacated by the decommissioning of NA highlands deputy Don Polye, goes to former agriculture and livestock minister Ano Pala (NA southern). Pala’s old job had been given to Lagaip-Porgera MP Philip Kikala (NA highlands). Potape’s old post as minister assisting the PM on administrative matters had gone to Alotau MP Charles Abel (NA southern), who voluntarily left the culture and tourism ministry to support Sir Puka Temu’s failed bid to oust Sir Michael last year. Abal expressed full confidence in his new ministers, saying he believed that with his new team, stability and cohesion within government would be sustained including consistency in policy implementation. “I have full confidence in the new ministerial line-up,” he said in a statement last night. “I congratulate all of them and expect their full cooperation and dedication to the service of our people,” he said. The URP is a divided house with a Duma faction and another faction supporting Southern Highlands Governor Anderson Agiru. The Duma faction yesterday also announced the sacking of Agiru but, in the reshuffle, it would appear Abal is siding with the Agiru faction in recognising Potape. Still, the URP is one ministry short (Potape’s old job). There was intense lobbying ever since the sacking of Duma and Polye for replacements but Abal was understood to have been consolidating his position and, particularly, strategising on how to place his party on a firm footing for the elections. The fallout today will be noisiest from Abal’s own highlands region. The Duma and Polye sackings had brought loud protests from Western Highlands and Enga. Abal had added Southern Highlands with the demotion yesterday of PNC leader and Ialibu-Pangia MP O’Neill from the coveted finance and treasury ministry. Papua New Guinea will go to the polls next year but there is no­thing for the citizens to get excited over. Since 2002, parliament has been dysfunctional as the government has not demonstrated its political will and commitment to put in place the required wide-ranging political reforms. The whole aim should be to improve PNG’s political and government systems and processes. The government has no excuse for failing to deliver when it has the mandate to rule for two terms and resources at its disposal to use to make the system work. The truth is our government is not really working for the people and country. It is a sad state of affairs to now have a prime minister who should have called it a day a long time ago. What has he really left behind? We do not even have a solid foundation of an “improved political system” for those who come after him. As a result, these new members of parliament will now, it seems, take the country forward into an uncertain future. Yes, our parliament and MPs certainly need more training so they know that what is required of them as elected representatives of their people. The majority of our MPs are shirking their responsibilities as lawmakers at the expense of Papua New Guineans. What I am going to say is not being patronising but the truth. If they all tried hard, the 108 MPs will certainly learn something of value and substance from our only woman MP, Dame Carol Kidu, in what they should have done these past nine years. It is a pity Dame Carol is not coming back in 2012. The Dame has had enough of PNG politics and is taking her life back at her coastal home with her adopted Motuan people. Thank you Dame Carol, you are a champion of the people. Your good deeds will not be forgotten for a very long time. Basil asks: How is the State protected in terms of disputes arising out of resource projects? I would like to direct my question to the Minister for Justice & Attorney General Honorable Sir ArnoldAmet, Governor of Madang Province. Mr. Speaker, we are experiencing unprecedented resource sector boom and this government is signing agreements with foreign companies left-right-centre. Whilst we appreciate the benefits that the projects are generating, we also have to be mindful of the legal implications of the kind of agreements that the State is committed to. Can the Justice Minister and the Chief Legal Advisor to Government tell this house how the State is protected in terms of dispute arising out of these projects? Mr. Speaker, the former Minister for Justice, Dr Allan Marat denied perusing through the full contents of the LNG agreement with the developers such as Exxon Mobil. Up to this day, no one had seen the contents of the initial agreement, including myself. This Parliament was and is led to belief that everything is okay, carried away by the promise of the unprecedented wealth. However, what is apparent now is that the LNG agreement was rushed through without proper consultation and meaningful involvement by the parties. Can the Justice Minister confirm or deny that there are 60-70 cases involving the LNG project are pending in the National and Supreme Courts and if so, does this confirm of a rushed agreement. Can the Justice Minister assure this Parliament and the people of Papua New Guinea that the LNG Project agreement as well all other recent agreements by this government, have in the agreement a clause for the PNG laws to apply when there are disputes between the State and the Developer? Mr. Speaker, we have learnt the Sandline Crisis case where the law to be applied to resolve the dispute was not the PNG laws, hence the State was ordered by an arbitration which was held in Queensland Australia where the State was ordered to pay US $18 million plus interests. Also, is it not true that Downer Construction Arbitration regarding the breach of contract over the Ramu-Madang road was conducted in Australia using Australian laws and that the State has to pay around AUS$35million (equivalent to K100m) of which around AUS$7million had been paid early this year. Given those examples, Mr. Speaker, can the Minister for Justice assure this Parliament and the people of PNG that the contractual arrangements that this government is entering into have a clause in the choice of our national law? Can the Minister for Justice assure this Parliament that in his capacity as the Chairman of the Judicial & Legal Services Commission and the Minister responsible for Justice, he is ensuring that developers have confidence in our judiciary system when it comes to the preference of laws to apply? LOCALLY-owned helicopter company Helifix Operations Ltd, yesterday introduced its latest helicopter to its expanding fleet, bringing the total to 13 helicopters, The National reports. Chief executive officer Robert Agarobe said the Bell 407 was the second of three, the first arrived in April and the third is expected before the year’s end. He said the helicopter, which cost about K8 million, was bought in Germany, packed and shipped to Sydney, Australia, where it was assembled, and flown by Capt Sam Onno and engineer Peter Kenos for 16 hours along the north and south coast of Australia and PNG respectively, to Port Moresby yesterday. Agarobe said that 12 of these helicopters (Bell Long Rangers and Bell 212s) were in the country while the 13th was doing offshore work in Australia. He said the company had grown since 2006 and with the oil and gas sector currently as a high profile industry, this challenged him to compete and operate his business especially in site work and seismic activities. “We cannot sit back and be spectators but be a part of this,” he said. Helifix is a 100% nationally-owned aviation company which currently employs top-class expatriates and nationals. Agarobe said the company also conducts trainings for staff to ensure transfer of skills take place as all employees were highly experienced and qualified. He said the new helicopters were safe and modern and, though costs twice more than the others, it would do twice more work to take the company to the next level, getting bigger and better in time, also expanding the client base. Micah: It's now or never!